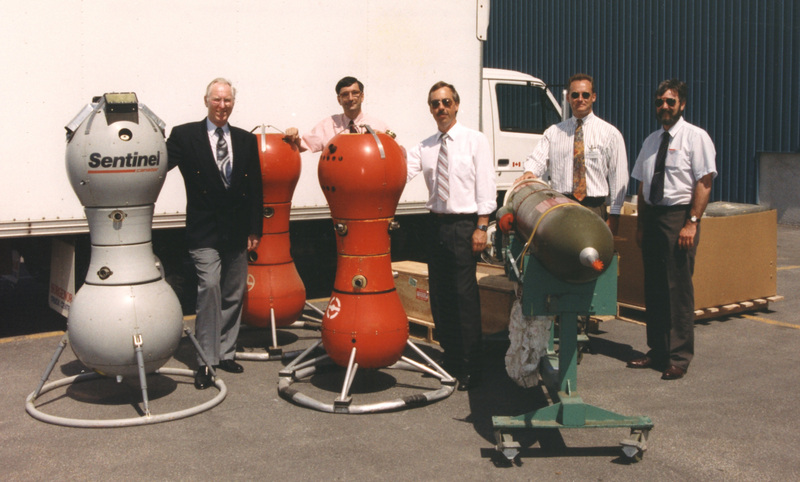 Bill Upton (centre) poses with colleagues from Canadair and the National Aviation Museum, in commemoration of Canadair’s donation of the remaining CL-227 vehicles and a Canadair CL-89 drone to the National Aviation Museum in June 1995. In honour of National Volunteer Week – April 15 to 21 – Ingenium is putting the spotlight on just a few of its invaluable volunteers. In today’s profile, the Channel highlights Bill Upton – a volunteer with the Canada Aviation and Space Museum. As a young boy in the 1960s, Bill Upton loved aviation so much that he spent his spare time writing letters to Canadian aviation manufacturers. “I would write letters multiple times a month, asking for photographs or lithographs of their products,” recalls Upton, who grew up in Chomedey, Laval, Quebec. “In four weeks, you’d get packages in the mailbox. Mom would get pissed off because all these big envelopes would be crammed in to the mailbox; she would ask, "What are you going to do with all this stuff?" Upton was collecting information on the subject he loved the most. His early efforts turned out to be time well spent; his love affair with aviation proved to be a life-long affliction, spanning both a career in aviation technology and a strong dedication to volunteerism. Growing up, Upton recalls his excitement around visits to the Canada Aviation and Space Museum (then called the National Aviation Museum). Ross Upton poses next to North Star 15 and 'his' nose gear doors and flaps in June 1969. As young Upton’s enthusiasm for aviation grew, so too did his opportunities. In 1979, he followed in his father’s footsteps by taking a job as a mechanical draftsman with Canadair. His role evolved; he went on to work extensively with flight tests for Canadair drones – a unique opportunity that took him all across North America. “We’d fly the thing and I was an observer in the field, with headphones and a cable connected to the main Control Trailer,” explains Upton of the first phase of Canadair’s drone testing. Following the first phase, Upton says the company decided to build a bigger drone that was autonomous. He was involved with developing a new system of building and supporting them. He recalls many adventures in drone testing – from working through an unexpected snowstorm in Alberta to working alongside Hercules aircraft that were dropping off troops in Yakima, Washington. Since Upton’s hobby is modern military aviation photography, he documented his working adventures on film. Bill Upton on assignment at the live fire military exercises in Yakima, Washington in May 1983. “I called our photos ‘Happy Snaps’ – I took a picture of the small test team from every single mission we were involved with,” says Upton, adding that he created special souvenir packages for all of his colleagues that worked on all phases of Canadair’s drone testing. Eventually, Upton worked as one of the operators during drone testing. He would frequently act as the advance party – travelling ahead of the crew to set up the logistical requirements for the next test phase. His work took him through all of the southern states till he left Canadair in the 90s. In the 1970s, Upton brought his considerable aviation expertise to a volunteer research and writing position with the Canada Aviation Museum. Since then, Upton has authored 17 aircraft histories on behalf of the museum. “There’s a very small group of people who actually do the writing,” says Upton of his volunteer working group, adding that he started by writing about Canadair aircraft. One of his writing highlights was getting the opportunity to write about the Canadair North Star. What is timeless, however, is Upton’s invaluable contributions to the museum’s Library and Archives through his meticulous attention to writing and editing aircraft histories. In 2015, the Canadian Aviation Historical Society honoured Upton’s writing skills with an award for his aircraft history about the Canadair Tutor.